My Harvard Business School professor, Michael Porter, gave a compelling talk at HBS on the next wave of strategic competition. He spoke while waving a tennis racket made by Babolat. Their competitor, Wilson, is selling tennis rackets by getting hot tennis pros to use their rackets and create brand awareness. 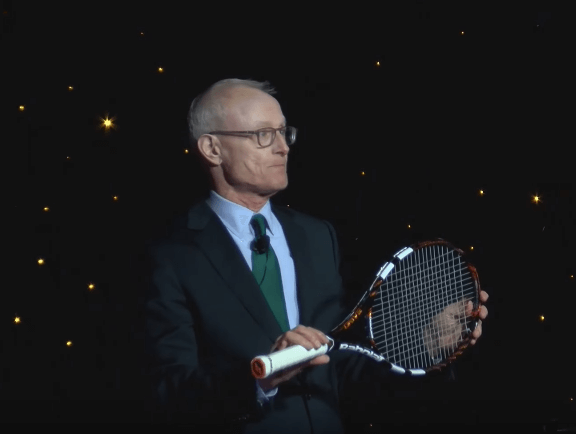 Babolat is creating a strong connection with the buyer after the sale of their racket. The Babolat racket sends a stream of data from sensors in the racket about every stroke and hit of the ball to the player’s smartphone. Data from the customer’s use of the “Smart Tennis Racket” creates added value for the player. Data from many players in aggregate can create additional value either for the company’s use or sale to others. Being thoughtful and creative about how to produce, analyze and deploy data from their customer’s use of the racket is the key to a fundamentally different form of strategic competition with Wilson. What exactly is the product that these two companies are selling? It is not just a tennis racket that can hit tennis balls. Can your products create data about how they are used and about your customers? If so, how will your company have to change to capture the value of this data? We do not have a public video of Prof. Porter’s talk at HBS, but here are two links to his perspective. The Economist had a future of capitalism discussion about how the connection that companies will have with their customers is changing because of Smart Products and includes the Porter analysis – HERE. A somewhat different form of the full Porter talk is available below.